To make cookies about the same size, measure dough for one cookie with a ruler, then use that dough to measure all the rest. These sugar cookies are all dressed up and ready for the cookie exchange. 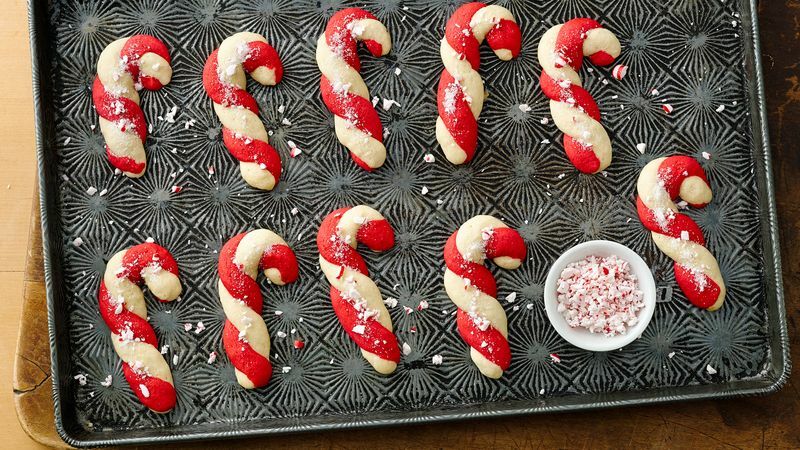 With their red and white braiding and crushed candy canes on top, we can’t think of a cuter or tastier cookie — nothing beats a scratch sugar cookie! This recipe is based on a classic from the 1963 Betty Crocker Cooky Book. This updated version has extra sweetness and oomph from the vanilla and peppermint extract. With 54 servings, it’s perfect for sharing at a cookie exchange or giving as a gift. Once you’ve mastered this classic, check out the rest of Betty Christmas cookie recipes.